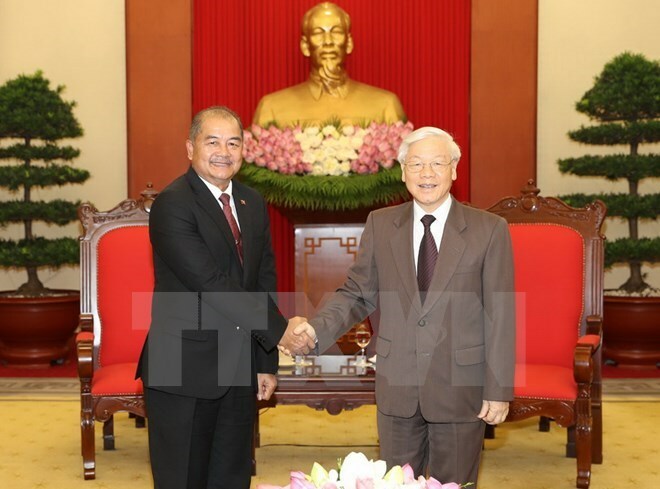 Hanoi (VNA) – Party General Secretary Nguyen Phu Trong has suggested Vietnam and Laos intensify cooperation to clear up urgent issues in renovation in each country, especially regarding the building of the Party and political system, socio-economic development and international integration. He made the remarks at a reception for Secretary of the Lao Party Central Committee, Head of the Lao People’s Revolutionary Party (LPRP) Central Committee’s Commission for Propaganda and Training, and President of the Lao National Council for Social Sciences Kikeo Khaykhamphithoune in Hanoi on August 1. The Lao guest is in Hanoi to attend the fifth theoretical workshop themed “Rapid, sustainable development”. The Party chief said Vietnam strongly supports the renewal process in Laos and believes that Lao people will obtain more significant achievements and implement successfully the Resolution adopted at the fifth national Party Congress. Vietnam will spare no effort to keep and nurture the special solidarity with Laos, he added. The theory work is extremely important to the two countries’ Parties, he said, adding that the fifth theoretical workshop creates a good chance for the two sides to share experience in the field. For his part, the Lao official expressed his pleasure at the bilateral growing relations in all fields.